Do any of these antibodies react with rat tissue and if so can they be used to stain paraffin section? Unfortunately, none of the three antibodies you are interested in have been tested in in both the application you are interested in with rat samples and we do not have any other antibodies against Apolipoprotein E which have either. Ab7620 has been shown to detect the rat Apolipoprotein E, but has not been used in IHC. 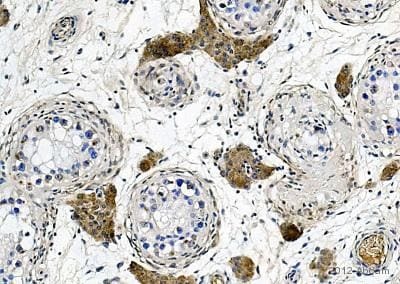 Ab1906 has been used in IHC with paraffin embedded sections but not with tissue from rat. From the sequence homology of the immunogen used I would also suggest that this anitbody would be unlikely to cross react with protein from rat. 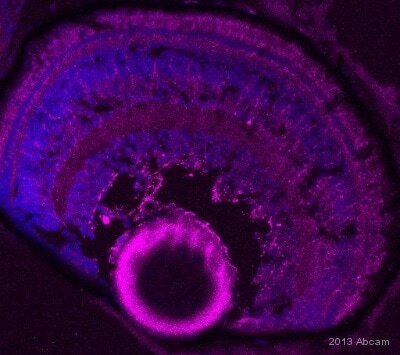 Finally, ab20874 has been used with rat samples and IHC with frozen sections, but not in paraffin embedded sections. 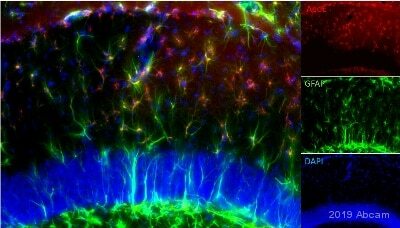 We cannot therefore guarantee how any of these antibodies would perform in your experiment. I would suggest that ab23832 may be the most suitable to try to see if it would be suitable for your experiment. If you would be interested in participating in this scheme please do let me know as a discount code needs to be issued prior to the purchase of ab23832. Thanks a lot for your help. Please send the replacement with our regular shipment. This is to let you know that I have placed a new order for you - for one vial of ab1906 as a free of charge replacement and the new order number is 1206066. She told that other antibodies wworked well and the control was also ok. She also made different dilutions and the antibody didn’t work. Increasing the BSA concentration also didn’t give good results. I hope that the information will help. Thank you for getting back to us with the updates. Currently we have new batch in our system so I can offer your troubled customer a free of charge replacement and a credit note which can be used in the next order. Here is a complaint form regarding ab1906. Thank you for contacting us and for sending the questionnaire. The details provided enable us to closely monitor the quality of our products. I am sorry this product did not perform as stated on the datasheet and for the inconvenience this has caused. The only lot of ab17929 we have in stock is the same as the one metioned in the questionaaire. Therefore, as requested, I have issued a free of charge replacement with one unit of ab20874. This free of charge replacement was added to the order number ******. - to load a maximum of 30µg on the gel. Too much protein usually brings a lot of background. - to dilute the primary antibody more (1/1000 is commonly used), too much antibody usually brings a lot of background too. I’ve got the fullfilled document from my client and I send it back to you. I hope that it helps to solve the problem. 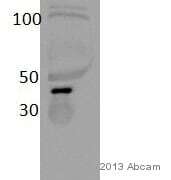 Used more antibody –dilution 1/300! Thank you for your enquiry regardingab1906 and for taking the time to provide some useful details of the experiments. 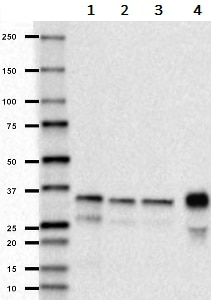 I am very sorry to hear that your customer ishaving problems with this antibody. I would suggest increasing the concentration of the blocking agent from 1% to 5% and using this solution for diluting the primary and the secondary antibody as well. It may be worth diluting the primary antibody further ie. 1/750 and 1/1000. Does the detection system work fine? Have you used it successfully with another primary antibody? Have you run a no primary - only secondary antibody - control to see if any of the non-specific bands are due to the secondary or not? If you have not done yet, I would advise you to check it. I hope this will be useful for you. Should your customerstill have any problem with this antibody after following these suggestions, then please confirm the batch number and the Abcam Order Number and do not hesitate to contact our Technical Department again. 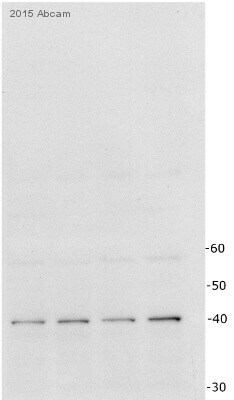 I have complaint from my client who bought on 24.08.2012 the antibody ab1906. She has unspecific bounds in WB. The description of the problem is in appendix. I hope that you will solve the complaint positively. 2) It would be much appreciated if you could attach a full size WBimage with molecular marker bands (MW) to the response. Please also describe what the different lanes represent.